No entertainment value here, just a straight-up FO report. I finished spinning and plying the green roving that I ordered from Knit Picks when I decided I just had to learn to spin. The color way is Aurora Heather, the fiber Wool of the Andes Peruvian Highland wool. The WotA fiber is nicely prepared and has little VM to pick out. I have found it easy to spin, so I’d definitely recommend it for a beginning spindler. I don’t think I did a very good job of plying this yarn. I should have put more twist into it. The yarn isn’t very springy. Live and learn. 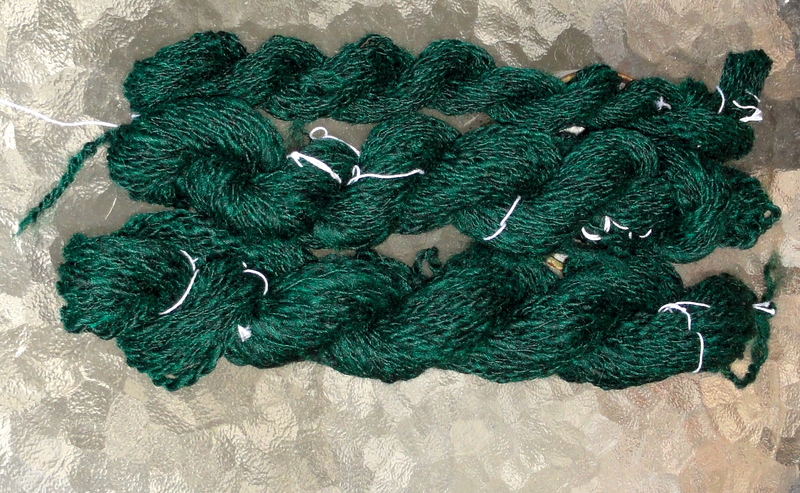 This entry was posted in Spinning and tagged handspun yarn, Wool of the Andes roving. Bookmark the permalink. The colour is still lovely. And it would work for something you want a lofty feel too. Maybe a toque? Thanks, kniterly. The yarn is likely to become a toque. I’m rather mad about knitting hats, although it’s been a while since I made one. Welcome to the world of spinning. I just entered it a little over two weeks ago, and I have learned a lot from the wonderful spindlers on Ravelry.